Skagit Guided Adventures offers birdwatching tours from the Salish Sea to the North Cascades, Fall and Winter, when birding is at its best in Magic Skagit! This 3-hour Eco Tour takes you around Skagit Valley’s farm fields in search of the thousands of Snow geese & smaller flocks of Tundra and Trumpeter swans. They spend over-winter here grazing, moving from field to field throughout the day and from day to day. We’ll also be on the lookout for bald eagles, other raptors and open field bird species. Time and interest permitting, stops will be added to search for shorebirds and other waterfowl near the farmlands. 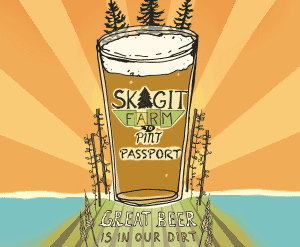 This 7-hour Eco Tour includes the 3-hour Skagit Valley Geese & Swans Eco Tour itinerary. After lunch, we’ll visit other excellent birding locations in Skagit and Padilla Bays to look for waterfowl, shorebirds, raptors, Great Blue herons, and more. Ever been to a heronry? Two of the largest and most important heron nesting grounds in the US are located right here, in Skagit County! Time and interest permitting, we’ll go birdwatching in Anacortes and/or Deception Pass State Park, both at the edge of Salish Sea. 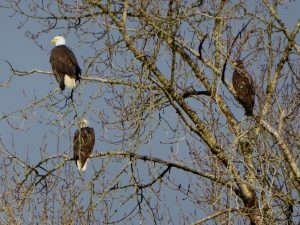 This 6-hour Eco Tour takes you to experience the winter wilderness along the Skagit River where hundreds of migratory bald eagles congregate to feast on the winter salmon run. While you watch, listen and learn about the regal bald eagles during our crisp winter days, you’ll find yourself surrounded by the snow covered mountains of the North Cascades, as well as the moss & lichen covered forest trees. The life cycle of salmon, the different species, and their importance in sustaining the bald eagles, bears, orcas, as well as the PNW fisheries and ways of life will be discussed. You’ll also understand the role our magnificent temperate rainforest plays in sheltering the entire Skagit River watershed system on which its wildlife and humans depend on. Weekends include a visit to the Skagit Bald Eagle Interpretive Center and weekdays to the salmon hatchery.